Stakeholder dialogue - IZW Leibniz Institute for Zoo and Wildlife Research in the Forschungsverbund Berlin e. V.
Wildlife-human conflicts are an increasing problem on all continents of the globe. Some conflicts can be clearly defined, while others are more difficult to identify, because they are side-effects of human activities not directed towards the conflict species. The resolution of all such conflicts ideally involves the relevant interest groups (stakeholders) such as farmers, livestock owners, hunters, conservationists, lobby organisations, local government and others. In recent years we have continuously involved stakeholders in our conservation-oriented research projects, organised workshops and conferences and maintained regular feedback on research progress. This interactive approach was applied in European, African and Asian context and provided decision-making stakeholders with detailed information on the biology and ecology of wildlife species as well as recommendations to reduce human-wildlife conflicts. White-tailed sea eagles Haliaeetus albicilla in Germany regularly suffer from lead intoxication caused by fragments of lead based hunting bullets in game animals or viscera left in the field by hunters. 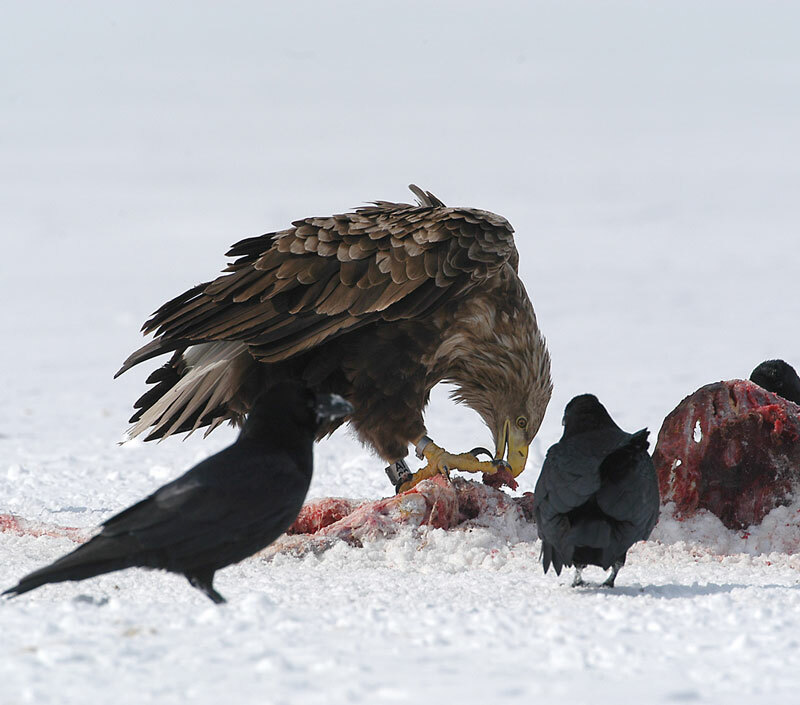 Lead intoxication is the most important cause of mortality in German white-tailed sea eagles and an unintended side effect of hunting activities. Stakeholders such as hunters and their local, regional and national organisations, the ammunition industry and conservation organisations were involved in the process of developing solutions to overcome the problem. In a joined declaration, the stakeholders agreed that the effects and risks of rifle bullets have to be critically examined and an assessment of available alternative bullet materials has to be made. It was also agreed to aim for a concurrent phase-out of lead based rifle ammunition in the range of the white-tailed sea eagles. Lead in food, especially in venison, recently also received increased attention with respect to human health. The detection of lead particles in game meat and the measurement of elevated lead concentrations in humans consuming game meat were alarming and pose a serious health risk for infants and adults. The Namibian farmland hosts the world’s largest free-ranging cheetah population. Cheetahs on commercial farmland have often been considered a threat to the farmers’ economic revenues from livestock and wildlife, thus large numbers of cheetahs have been eliminated by farmers. To protect cheetahs on farmland in a successful and sustainable way we collect scientific data on the economic and ecological role of cheetahs and maintain a constant dialogue with the farmers to understand their concerns about cheetahs and to report our results. 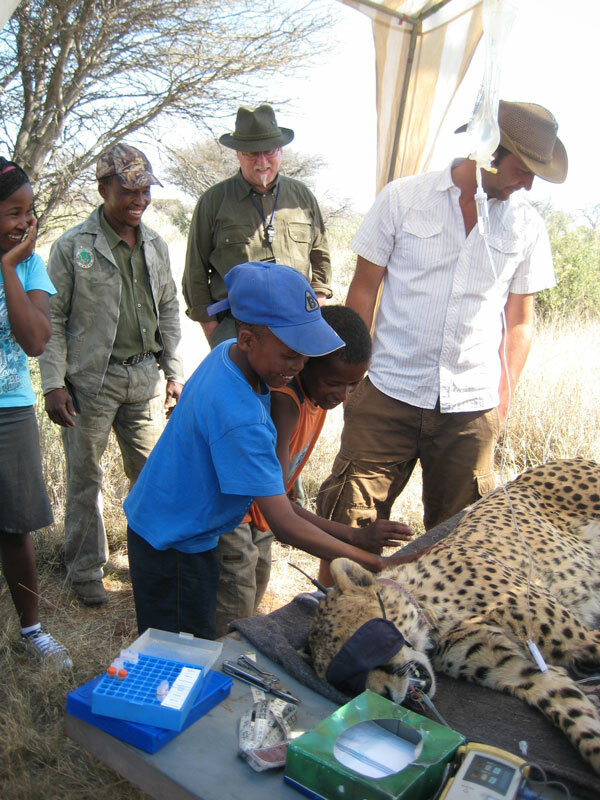 We also develop new methods to determine for example more accurately the diet of cheetahs. We regularly present our results at the farmers annual general meetings and conduct workshops. As one of the consequences of this constant exchange of information, an increasing number of farmers actively cooperate with us and have captured in the last few years nearly half of the cheetahs we collared and monitored. This cooperation is crucial because farmer activities and decisions have a significant and direct influence on the cheetah population. South East Asia is a hotspot of the global biodiversity crisis, and large mammals such as the Sabah rhinoceros (Dicerorhinus sumatrensis harrissoni) are among the most seriously threatened species in this area. Once widespread in Borneo, habitat destruction and poaching reduced their number to less than 50 individuals over the past 15 years. 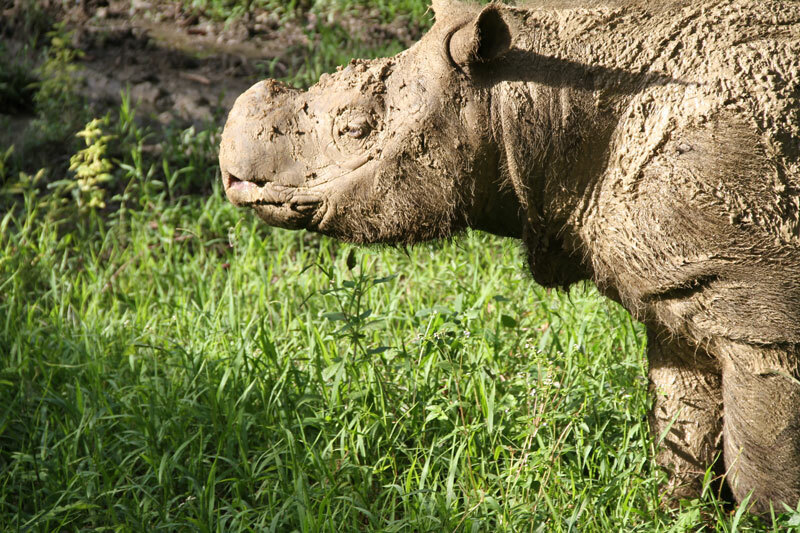 The IZW started, together with the government of the Malaysian state of Sabah, the Borneo Rhino Alliance, WWF Malaysia and the Zoo Leipzig, a comprehensive conservation programme to protect and breed this highly threatened rhino species. The responsibilities and goals of this programme have been defined in an integrated species management plan that combines in situ and ex situ conservation efforts. We collect quantitative information on the intensity of poaching in the few remaining habitats of the rhinos and produce maps indicating poaching evidences in the forest. Recommendations generated from the data analyses are given to the government of the Malaysian state of Sabah and discussed in workshops with all partners involved in the integrated species management plan for the Sabah rhinoceros. The IZW is also conducting a comprehensive study on carnivores in Borneo. In June 2011 we organised, together with three Specialist Groups (Cat, Small Carnivore, Otter) of the IUCN Species Survival Commission and the government of the Malaysian state of Sabah, the 1st Borneo Carnivore Symposium (BCS), Road towards Conservation Action Plans. 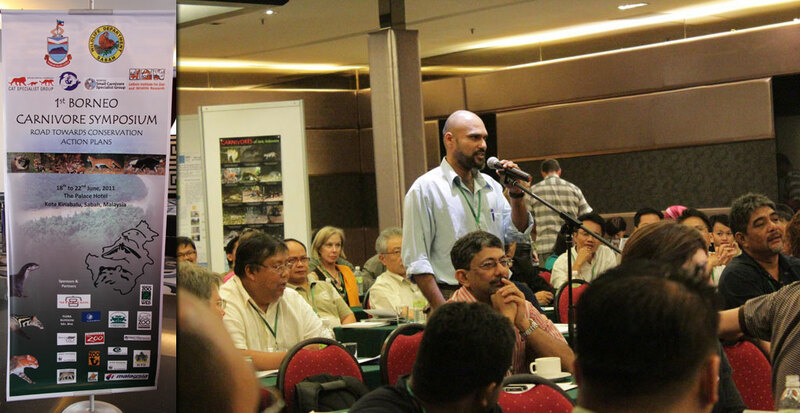 Almost 200 international experts met in Kota Kinabalu, Malaysia to discuss strategies to reduce the serious threats of Bornean carnivores, where over 50% of carnivore species are classified as Threatened in the IUCN Red List of Threatened Species. Borneo is shared by three countries - Brunei Darussalam, Malaysia and Indonesia, and a key focus of the BCS was to enhance the dialogue between scientists, conservationists and the governmental authorities of these countries. Wachter B, Blanc AS, Melzheimer J, Höner OP, Jago M, Hofer H (2012) An advanced method to assess the diet of free-ranging large carnivores based on scats. PLoS ONE 7. Krone O (2011) Bleivergiftungen bei Greifvögeln. Ursachen, Erfahrungen, Lösungsmöglichkeiten. Der Seeadler als Indikator. Proceeding of the Conference "Bleivergiftungen bei Seeadlern: Ursachen und Lösungsansätze" from April 16th 2009 in Berlin. Berlin: Freie Universität. p 127. Shepherd CR, Belant JL, Breitenmoser-Würsten C, Duplaix N, Ambu LN, Wilting A (2011) Conservation challenges and opportunities for Borneo’s carnivores. Traffic Bull 23: 89-91.